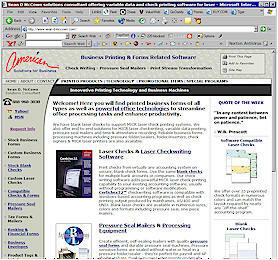 Checkwriting and Check Printing Software for Pressure Seal Checks Forms and Mailers! Visit us for for a complete line of printed products as well as software to convert and restructure laser printing to fit our laser printer-compatible pressure seal forms, pressure seal checks and integrated forms with labels and membership cards. Check writing and laser check printing software to enhance document security and print checks complete with the MICR line and signatures on secure blank checks using a Troy MICR printers or a MICR toner cartridge in your existing laser printer. Choose Pressure Seal Folder/Sealers from five manufacturers. Mechanical and electronic check signers as well as secure check signing software. Reformat your print jobs for restructured laser printing using our laser printing utilities. Change the printed layout coming from your programs to fit versatile integrated forms with membership cards or labels or perform secure laser check printing complete with the MICR line and signatures. Secure check signing software is available that stores signatures on an encrypted USB flash drive. Variable data and variable content printing for restructuring your computer generated output to fit pressure seal checks and other integrated forms and mailers. Change and restructure the printed layout of your standard reports or print checks on blank forms complete with a MICR line. Add automatic check signing to the check printing process. Modify and convert printing from ordinary software applications to fit integrated label forms or integrated card form combinations. Transform printing from your accounting system to fit secure blank checks and pressure seal mailers. Transforming your output is easy with our PlanetPress output management software or our Windows® print utility. Convert to laser printing from continuous forms using powerful output reformatting and transformation software compatible with popular laser printers. Store PCL and postscript electronic form overlays in laser printer memory, hardware storage devices or on an e-forms server and merge your converted data with electronic forms at print time. Use a MICR toner cartridge in your existing laser printer or buy MICR printers to print laser checks with MICR - Magnetic Ink Character Recognition. PGS offers expert computer repair, computer sales and computer software training in the New Hampshire seacoast region including the communities of Dover NH, Durham NH, Exeter NH, Hampton NH, Newmarket NH, Rye NH, Portsmouth NH and Seabrook NH. Repair or replace malfunctioning computer hardware components. Rid your PC of annoying pop-up advertising, viruses and spyware. Prevent viruses while preserving and insulating your important data. Restore your computer to it's original settings and performance. Enhance the speed, reliability and capability of your computer. Install a reliable system for backing up your critical business data.